Weeknight cooking doesn’t have to be boring, pre-packaged, or microwaved. Yes, you’re tired from a long day of work, but with a little advanced planning a satisfying and fresh dinner can come together in minutes. What’s the trick? Organization. The less time you have to cook during the week, the more organized you need to be. I suggest planning out a week’s worth of meals in one sitting. I make a chart that includes each day of the week and then fill in what I will be eating for each day. I then pull together any recipes that I’ll be using and go day-by-day to compile a grocery list. Once you have your grocery list, head to the market and/or your grocery store. I recommend doing this on a weekend morning and not after a long day’s work. I can’t tell you how many times I’ve walked into the grocery store at 5:30 with grand ideas for dinner and 15 minutes later, as I load groceries into the car, hitting the wall and ditching all culinary plans in favor of pizza on the couch. By purchasing groceries on the weekend, you free up extra time for cooking on a weeknight. If work runs a little late, you won’t settle for McDonald’s because you don’t have the energy to stop by the grocery store on your way home. Once the grocery shopping is done, it’s just a matter of following your weekly plan. You’ll be amazed at how easy meal preparation becomes when you know not only what you are cooking, but also have the needed ingredients on hand. When I’ve done my legwork, cooking is much more pleasurable and less a chore. While not necessary, I recommend typing up your weekly menus and grocery lists on the computer. This allows you to save your work so you can re-use a weekly plan and grocery list in the future. You can easily tweak the lists to add or remove meals and after a while, you’ll have several weekly meal plans with grocery lists at your disposable. If cooking for yourself several nights a week is new to you, I recommend starting slow. To begin, set a goal to cook 2 or 3 nights a week and schedule in a night or two for take-out, a frozen option, or going out to dinner. I love to cook, but I always leave one night a week open. It takes the pressure off and allows me to have a break if my day has been hectic. If I end up cooking anyway, I go with something easy like re-heating frozen spaghetti sauce or having a “leftover” night to clean out space in the fridge. Along those same lines, don’t go crazy with your recipe choices. It’s a weeknight after all and deboning a duck after an 8 hour day is not going to go well. Find recipes with an active time of around 15 minutes that are straightforward. One pan recipes (like the one) below are particularly nice for the cook AND the dishwasher. If you find yourself enjoying cooking more as the weeks go on, then branch out to more difficult and time-consuming meals. It is great to include your old standby recipes on your weekly meal plan, but don’t forget to spice things up. I recommend experimenting with at least one new meal a week. 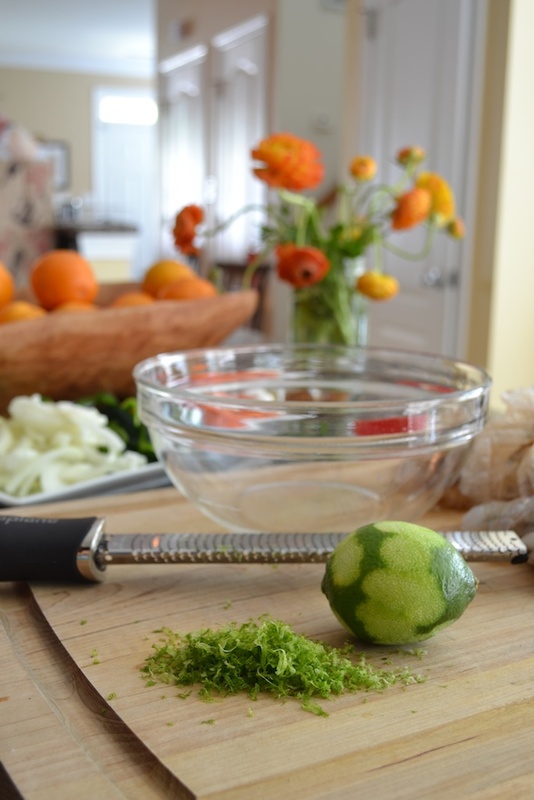 It’s a great way to challenge yourself and will keep cooking fun. 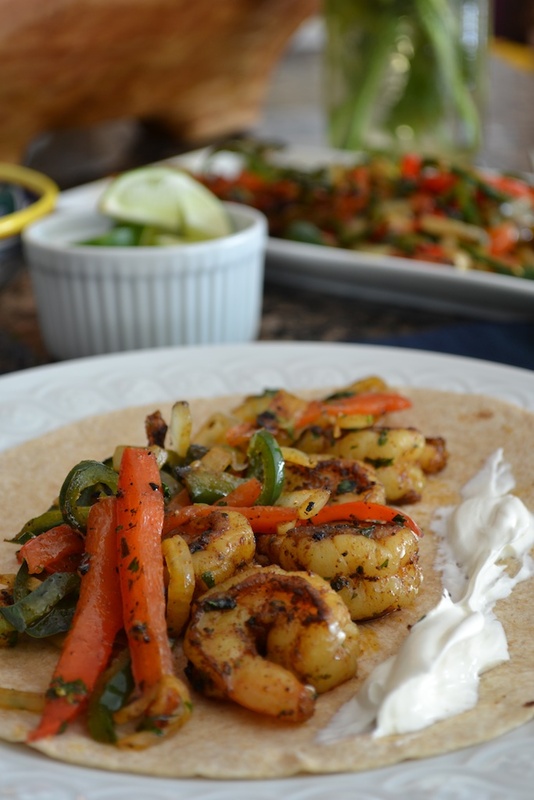 With that in mind, here’s a great recipe for Spicy Shrimp Fajitas to kick things off. I made it with shrimp here, but feel free to substitute chicken, beef, or even a meat-substitute like seitan (“say-tan”). No matter what you use, you’ll find the recipe delicious and a successful substitution will build your kitchen confidence. Happy weeknight cooking! Substitute chicken, beef, pork, or even a meat-substitute like seitan (“say-tan”) for the shrimp in this quick and easy recipe. Place the shrimp in a large bowl. Combine the chili powder, cumin, brown sugar, salt, black pepper, and cinnamon in a small bowl. Add 1 tablespoon of the olive oil and the lime zest to the shrimp. Add about 2/3s of the spice mixture to the shrimp and toss everything to combine. Reserve the leftover spice mixture. Heat a large (12-inch) heavy-bottomed skillet (I think a cast-iron frying pan works great for this) over medium-high heat. Add 2 tablespoons olive oil when the skillet is very hot. Add the onions and peppers and cook, stirring occasionally, for about 6 minutes. Don’t stir constantly as you want the peppers and onions to blister a little to add flavor. Halfway through cooking, stir in the remaining spice mixture. When the peppers and onions are soft, toss in the garlic and stir for 30 seconds more and then add the cilantro. Toss to combine before tasting for seasoning and adjusting as needed. Spoon the pepper mixture into a serving bowl or plate. Add the remaining 1-tablespoon of olive oil to the skillet set over medium-high heat. Add the shrimp and cook, stirring occasionally, for about 4 minutes or until the shrimp are cooked through. Return the pepper mixture to the skillet and toss everything to combine. Serve immediately on warmed flour tortillas with sour cream and a squeeze of lime. It’s dinner time here and I was too lazy to start cooking. This is great inspiration. I will press “post comment” and rush to the kitchen. Thanks for a great post and motivation!! Glad I could inspire. Hope your dinner is a good (and simple) one. Glad to have found your blog and am looking forward to reading more! 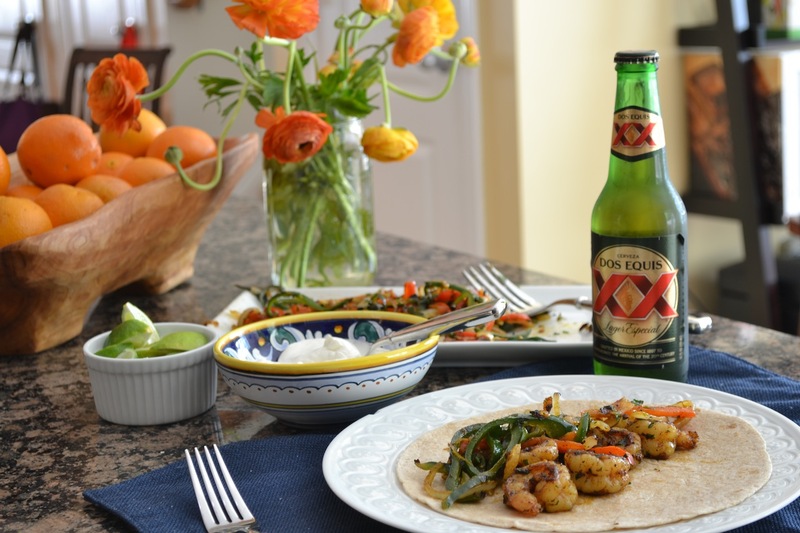 Your shrimp fajitas look delicious and your photographs are wonderful. Thank you! Appreciate you taking the time to check my blog out. Happy cooking! this looks soooo good! adding to the ‘must try’ list! Nikki, You have presented this one really beeautifully. i wish that I could put it together –with the Mandarin Oranges and the pretty flowers (I know the name but can’t remember) in the mason Jar. Love Grannie! Definitely a new summer staple. Thanks Nikki! So glad you enjoyed it! Happy cooking, friend!